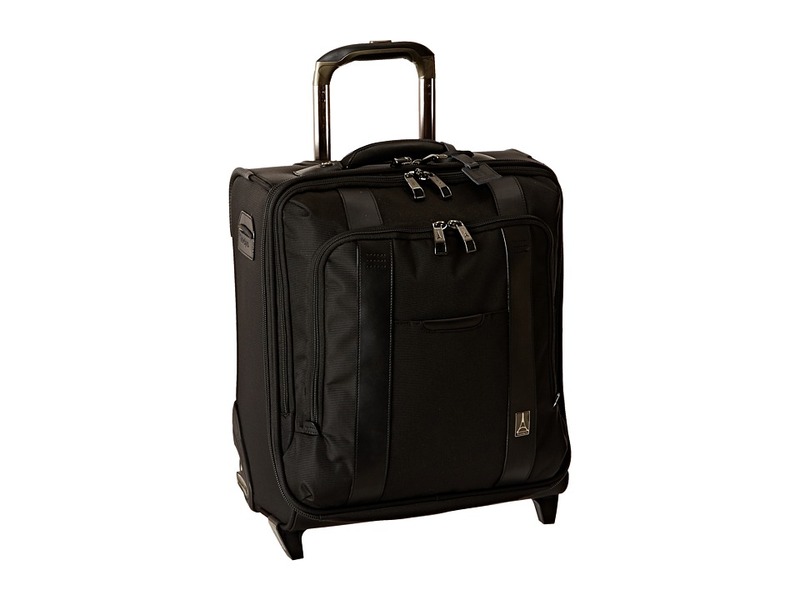 For today~s business and frequent travelers, we present the premium craftsmanship of the Travelpro Executive Choice Rolling Business Overnighter! Part of the Executive Choice collection. Padded and quilted corduroy pocket for laptops up to 15.6 in, plus a separate padded tablet sleeve. Built-in business organizer and removable cord pouch provide efficient storage for business essentials and power cables. RFID-blocking pocket keeps credit cards and passport hidden to protect against loss and identity theft. Patented PowerScope Extension Handle minimizes wobble when fully extended. The 42 in stop ensures a comfortable roll for users of all heights. Genuine leather carry handle and accents combined with rugged nylon fabric and DuraGuard coating provide exceptional durability and stain resistance. SUPRA zipper heads and built-in abrasion guards resist damage from daily use and abuse, providing ultimate durability. High performance sealed ball-bearing wheels are built for high-mileage travel and are tested to ensure the smoothest of rolls. Imported. Measurements: Bottom Width: 14 in Middle Width: 14 in Top Width: 14 in Depth: 7 in Height: 16 in Handle Length: 6 in Handle Drop: 1 2 in Weight: 9 lbs Proposition 65 WARNING: This product contains chemicals known to the State of California to cause cancer and birth defects or other reproductive harm.